Washington: About 43 million years ago, when South America was surrounded by water on all sides, there lived a whale with four legs, elongated toes, sharp teeth and perhaps even fur. This ancient creature looked more like the love child of an otter and a crocodile than any modern-day whale. And, unlike today’s whales, which dwell exclusively in the sea, this animal lived some of its life on land. “I think they were not very good at walking, and certainly not at running,” said Olivier Lambert, a vertebrate palaeontologist at the Royal Belgian Institute of Natural Sciences in Brussels. Lambert has spent a lot of time with this whale, which was discovered in 2011 less than a mile from the beach along the southern coast of Peru. *It had four limbs, like the whales that first evolved in present-day Pakistan and India more than 50 million years ago. *It was one of the earliest whales known to have lived in the New World. *It belonged to an entirely new genus and species of whales. “We found a really incredible specimen,” said palaeontologist Rodolfo Salas-Gismondi of Cayetano Heredia University in Lima, who was part of the team that reported the find Thursday in the journal Current Biology. The study authors dubbed it Peregocetus pacificus, or “the travelling whale that reached the Pacific.” The name honours its role in helping scientists understand how early whales migrated from the Mediterranean to the Atlantic and eventually to the New World, said Lambert, the study’s lead author. The specimen’s fossilised remains are not only very old, they are very much intact. The connections between the bones indicated to the researchers that this whale had reached adulthood. It probably measured about 13 feet from tip to tail, and it weighed at least several hundred pounds. Its legs were strong enough for the creature to stand on land, and it had hooves at the ends of its fingers and toes. But Peregocetus also likely had webbed feet to help it swim, Lambert said. Just like an otter, it might start by pushing back on its hind limbs. Then it might shift to undulating its body up and down from the tail to the hip. The whale fed at sea and probably only came on land for specific activities that could have included breeding or giving birth, Lambert said. That would be similar to the behaviour of seals and sea lions today. It only took a few hours of excavation for diggers to find the first traces of the whale in Peru’s Pisco Basin. The fossilised bones were embedded among marine deposits that dated back about 42.6 million years, to the middle Eocene Epoch. Whales are descended from artiodactyls, a group of mammals that includes cows, sheep, goats and other hoofed animals. The earliest four-legged whales from Pakistan and India lived in shallow rivers, said Hans Thewissen, an anatomist and paleobiologist at Northeast Ohio Medical University. 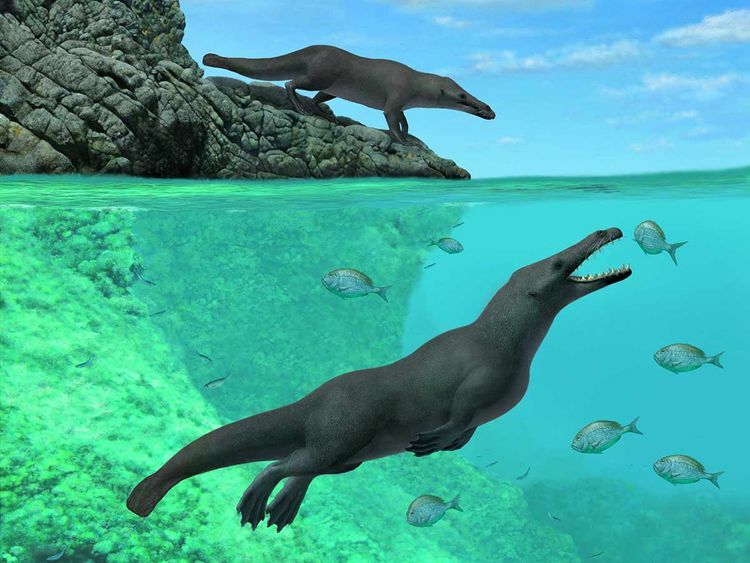 Hind legs likely helped Peregocetus’ ancestors swim from the northern coast of Africa to South America more than 43 million years ago, Lambert said. At the time, the distance between the continents was only about half as much as it is today, and currents running between them may have facilitated the crossing. He said it was unlikely that the whale diaspora occurred in a single generation. But to travel that far, whales would have needed to spend days or weeks at sea, suggesting they acquired the ability to sleep in the ocean. As whales spent more time swimming, they gradually lost their hind limbs, which interfered with a swimming motion that relied primarily on tail movement, Lambert said. “The tail is much more efficient for locomotion than a combination of tail and hind limbs,” he said. Nick Pyenson, curator of fossil marine mammals at the Smithsonian Institution’s National Museum of Natural History, said the report helps scientists understand the locomotive ability of early whales.